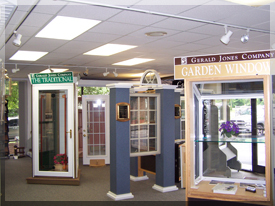 Homeowners have turned to family-owned Gerald Jones Company for their home improvement needs for three generations. There’s a reason we’re known throughout the Raleigh-Durham area as the top home improvement contractor that gets the job done right – on time, every time. If you have been dreaming of updating your home, you’ve come to the right place to beautify, protect and get more enjoyment out of your most important investment. With more than 60 years in business, you can be confident that the advice, recommendations and ideas supplied by our team are backed with proven experience working with homeowners like you. Whether you are interested in replacement windows or siding, or are considering an addition, new deck or sunroom, we’re happy to meet with you and provide a free, no-obligation estimate that meets your needs and budget, and exceeds your expectations. We invite you to visit our Durham showroom (please call first as we have irregular showroom hours) and browse the variety of windows, doors and other options available for your home. Or, we’re happy to meet with you at your home for a no-obligation estimate. Click here to schedule an appointment. In the mean time, please read the testimonials from our satisfied customers, browse our project gallery and learn more about the Gerald Jones Company.